If you are lucky enough to hold dual nationality through marriage or ancestry and qualify as a citizen of the EU, your attempts at relocating to Ireland will be substantially easier. Passport holders of EU member states will not require any kind of visa or work permit to enter the country, nor to stick around once gainful employment has been found, under the Freedom of Movement Act. If you’re making the move straight from the USA, however, more restrictions will be placed upon you. Buckle up, as you may be about to complete a great deal of paperwork and applications. 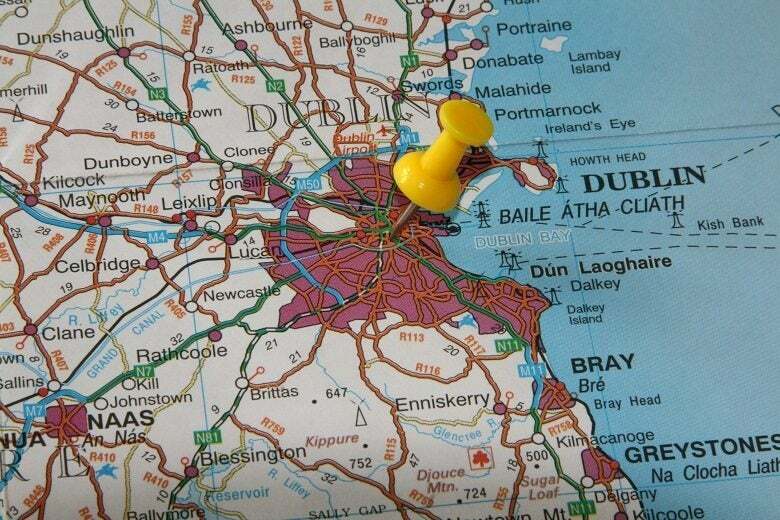 Check if your circumstances dictate that you will require a Visa to enter the country first, but if you’re planning on relocating to the Emerald Isle with any permanence and seeking a job, you’re also going to need an Employment Permit. Before you apply for a Visa and Employment Permit – and we strongly advise that your wrap up these processes before you set foot on a transatlantic flight – ensure that you qualify for such status. If you plan on staying in Ireland for less than ninety days, you can apply for a short stay visa – also known as a C Visa – though this may not be required. As a US citizen, you will typically be entitled to stay for ninety days or less without such a document. If this is your intention, however, you will not be permitted to work throughout your stay in the country. This may mean that you will need to provide evidence that you will be able to support yourself throughout your time in Ireland, or that you will have an appropriate sponsorship network that will finance your visit such as friends or family that will be housing you throughout your visit. Additional proof of your financial solvency may be requested if you are planning on using public accommodation, such as a hotel. Obviously your application will also involve a background check to ensure that you are of appropriate good character, and you will also be expected to provide evidence that you have travel plans for your return before your short stay Visa expires. If you plan on applying for a C Visa, or entering the country without one, never do so with just a one-way flight booked. For a longer stay, and the right to work, you could alternatively take advantage of the Working Holiday Agreement between the two nations. This will permit you to enter the country for up to twelve months, seeking work whilst in Ireland, though be warned that the casual work environment in Ireland is fiercely competitive. General Employment Permits, which entitle any US citizen to work in the country assuming they have an offer of work at a salary of €30,000 or higher. Your would-be employer will need to satisfy a Labor Market Needs Test before extending you a a job offer and having this accepted by the Irish Home Office, which is designed to prove that the role you will be fulfilling could not have been offered to an Irish national. Critical Skills Employment Permits, which are for highly skilled roles paying a salary in excess of €60,000 (or around €30,000 if the job is considered by Highly Skilled by the Irish government). If your role qualifies for this permit, there will be no hoops for your employer to jump through. Dependent/Partner/Spouse Employment Permits, for any spouse, partner or children that may be traveling with a US national that has found work within Ireland who can prove that they can support others financially during their stay. Reactivation Employment Permits, which are applicable to anybody that previously worked in Ireland and has returned to the USA. The remit surrounding these permits is quite strict, so be sure that you qualify before applying. Ireland has many reputable universities, and American passport holders will not need a Study Visa to enter full-time education in the country – all you’ll have to do is register at your closest Garda National Immigration Bureau (GNIB) in exchange for a residence card. How long you will be permitted to stay depends on the course that you will be studying, with most agreements running from three to seven years. Extensions are available in exceptional circumstances, such as ill health ensuring that you are unable to complete your course in the allocated time. It should be noted that, if you enter Ireland using a Study Visa or equivalent arrangement, your right to remain in the country is reliant on your remaining in full-time education; should you decide to switch to a part-time course, or engage in long-distance study that involves jetting back and forth from Ireland and the USA, you will be in breach of your terms and conditions. If you wish to enter Ireland to attend university, ensure that you have proof that your place on a full-time course is assured, and that you have paid a minimum of €6,000 of your university fees. You will also need to have a private health insurance policy in place as you will not be eligible for publically funded healthcare services, and evidence that you will be able to support yourself financially throughout your studies – you will be expected to prove that you have access to at least €3,000 in additional funding to ensure that you will not become reliant on state benefits. You will, however, be entitled to seek casual work of up to 20 hours per week whilst studying to top this up. If you wish to transition into a full-time job after completing your course, you’ll have to apply for an employment permit. You can apply for a Visa or Employment Permit – whether that is for a short stay, long stay or re-entry, on the Irish Naturalization and Immigration Service website. Once here, you can double-check whether you’ll actually need a Visa, and if so, launch your application process online. There is no hard and fast rule as to how long this process takes – and it will certainly be faster if you have all of your information in order before you start – but it can be as long as eight weeks.